Last week we gave you our review of Metro 2033 Redux , but today you can judge the graphical differences firsthand. We decided to throw both the original game and the Redux version to our irresponsibly large computer, the Large Pixel Collider , to scrutinize 4A Games' remastered environments, lighting and character models. We cranked all the graphics to max, set the resolution to 2560 x 1440, and started killing monsters. 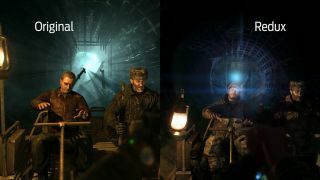 The original is still a good looking game, but Redux has some impressive new lighting effects, and runs much, much better—it stayed at a rock-solid 60 fps even during combat, which would drop Metro 2033 down to about 40 frames per second.